The Trades Electrician program is based on the National Center for Construction Education & Research, NCCER, certifications for Levels 1 and 2. 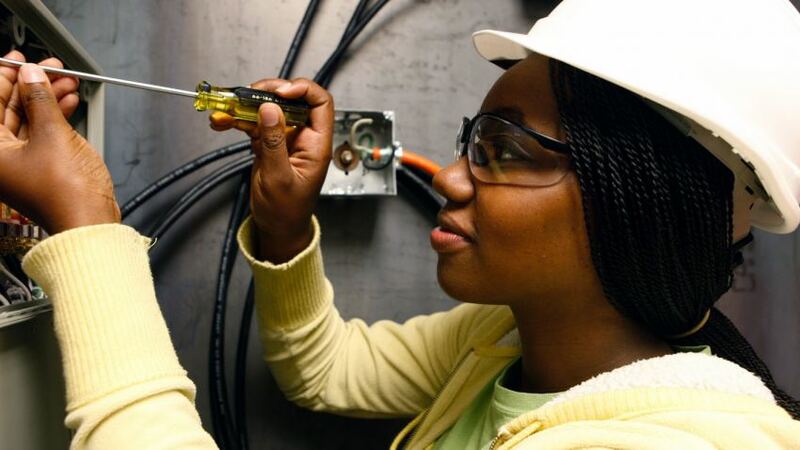 Designed to train basic electrical skills that are used in the home building and maintenance industries, the program is a combination of classroom and hands-on instruction, with an emphasis on hands-on practice while installing and hooking up electrical circuits using 110 and 220 voltages. Students will demonstrate complete safety awareness in a general construction environment to include electrical safety, fire safety, and tool safety. Proper methods for securing power and correct electrical grounding procedures will be practiced. Students rough in structures with all holes drilled, boxes established, with correct sized cabled pulled, as per drawings, in order to cut-in and hook-up fixtures correctly with proper grounding. Students can graduate with confidence in their job hunting skills from employability and job search skills covered during the program. Prerequisites: Attend an Information Session and complete Try Before You Learn. For more information call (757) 865-3122.